COLORADO -- Three Good Samaritans ran across an injured dog a few weeks ago that was stuck, frozen in a creek in Bible Park in southeast Denver. 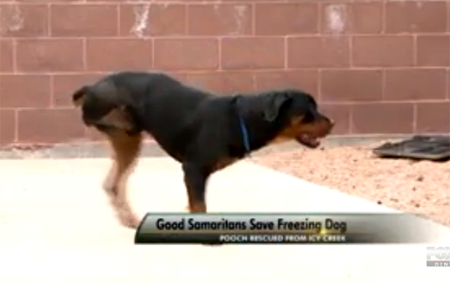 They got the Rottweiler out of the creek and took him to the Dumb Friends League nearby. The dog, named “River,” was nursed back to health and now he has a new, loving home. The people who take care of the dog believe he was hit by a car and that’s how he ended up in Goldsmith Gulch at the park. “He was injured and he was stuck in the gulch. There was some frozen water and he couldn’t get out. His back end was submerged in the water…and he couldn’t move,” Dumb Friends League spokeswoman Megan Rees said. “Our veterinarians immediately saw that his back leg was broken. The fracture was so complicated that we did have to amputate his leg,” Rees said. He gets around just fine on his three other legs. River didn’t have a collar or microchip. No one showed up to claim him, so they gave him medical treatment and set him up in a foster home. Just in time for the Black Friday “Name Your Price” donation discount, River went up for adoption. 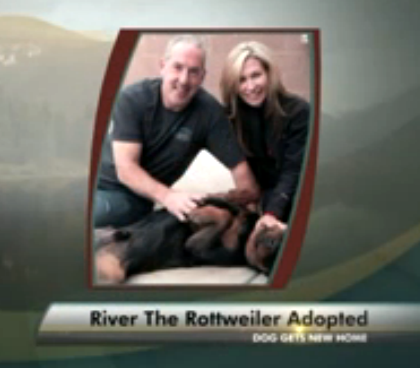 A couple from Highlands Ranch adopted River. They say they made up their minds to take him home even before they knew his story. CALIFORNIA -- When it comes to puppies, the smaller they are, the bigger the price tag. They are called “Teacup” or “Micro” dogs- the smallest puppies, culled from the smallest breeds. And dogs like that are worth thousands. 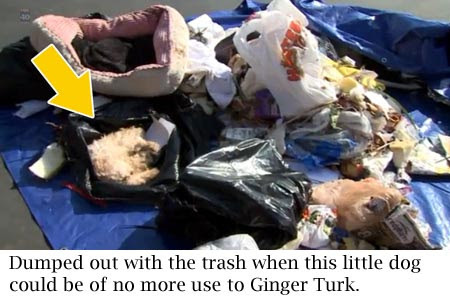 Sacramento’s Ginger Turk is a peddler of dogs like that. And earlier this year, she got national attention when she and her online storefront, “LaChicPuppy” made the US Humane Society’s list of 101 Puppy Mills. 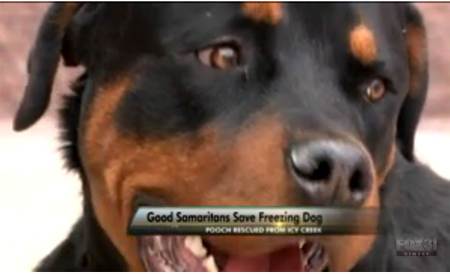 To find out why, FOX40 put in a call to Kathleen Summers, a Director for the United States Humane Society. Summers is talking about a 2011 case in Sacramento County against Turk. Four customers said their dogs died of Parvovirus after Turk forged a veterinarian’s signature, giving them clean bills of health. Turk was ordered to wear an electronic monitoring anklet, and once she got it off this summer we went out to see if she was up to her old tricks. “Who knows how many animals they had coming and going,” said Jeff Barker, who claims to be a former landlord of Turk’s. 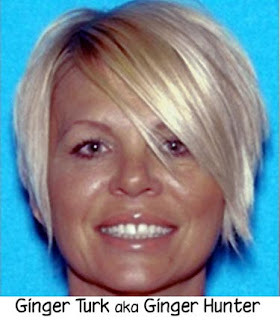 Barker said he rented his home to Turk and her husband in El Dorado County, but around the time he was learning about her history, she disappeared. 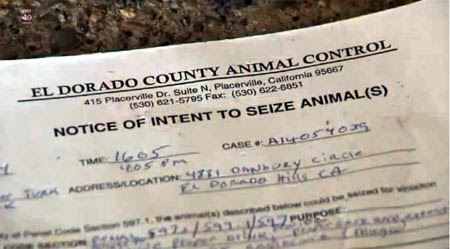 He says she left behind a mess- a wrecked home, rows of tiny dog cages, even a notice from El Dorado County animal control informing Turk they intended to seize her animals. “One month. It was over $200,000 of electronic deposits. Why are these people having trouble paying rent?” Barker asked. 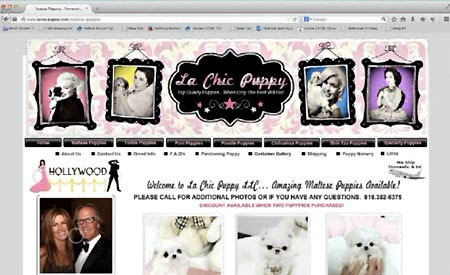 Turk’s website, La Chic Puppy, was still up. But Turk was gone. Then, in late August, a break. Another lawsuit filed against Turk, this time, she was living in Sacramento County. Another customer who says he got a sick dog. And this time the dog won’t fit in any teacup. Instead of the promised micro size, according to the suit, this dog grew and grew and grew. 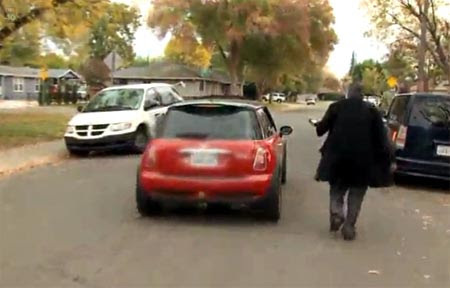 It was enough for FOX40 to trace Turk to a southeast Sacramento neighborhood. And it wasn’t long after asking around about Turk that we got a call, late at night. 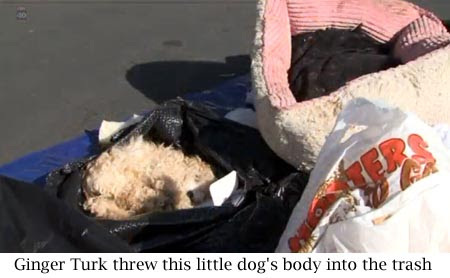 It was a woman, claiming Turk had thrown out a puppy and it’s body was rotting in her trash. The pictures were disturbing. 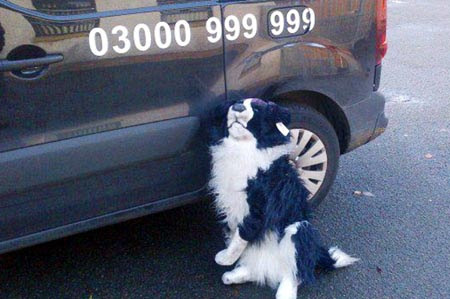 But we could confirm it: it was a dead dog, one that looks very similar to animals Turk sells. We immediately called Sacramento Animal Control. “Based on the tests, yes. 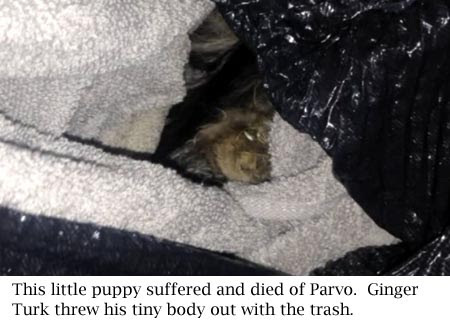 That animal tested positive for Parvo,” Gina Knepp, the head of Sacramento Animal Control, told FOX40. 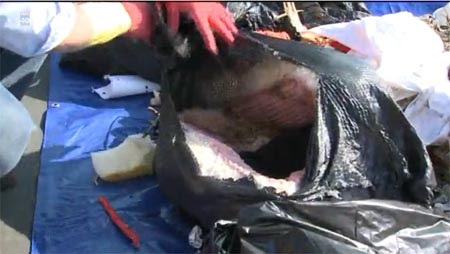 We didn’t know it at the time, but Animal Control had brought in the trash, and done a necropsy on the animal’s body. But they didn’t bring in Ginger Turk. So the next call we got on this story wasn’t from them. It was the same source. Telling us again that Turk had thrown out another puppy. So after Turk put her trash out that week, we looked for ourselves. It was the second dead animal in the span of a few weeks. Animal control didn’t seem to have an answer for what we were finding, so the time had come to get answers ourselves, from Ginger Turk. Her answer, over and over again was that she had no idea what we were talking about. Meanwhile, we asked animal control if they had grounds to shut her down. “People should wonder how she can continue to operate. She’s, I hate to say this, she’s pretty good at what she does,” Knepp said. She said that Turk could claim those carcasses, the dead puppies, were put in her trash by somebody else. And in fact, that’s exactly what she did claim, in a phone call to the FOX40 newsroom. “There are many organizations that would like to shut her down. And will we eventually? Absolutely. The cases will keep mounting, the work that you’re doing, eventually we will shut her down,” Knepp said. We spoke with Turk again before this story aired. She told us again that the dogs in her trash were planted there- planted by a woman she’s had business dealings with. Turk told us that she still sells puppies occasionally, but that there is no problem with parvovirus in her house and no animals have passed away there. She told us, if a puppy did pass away in her care, she’d take its body to a vet. 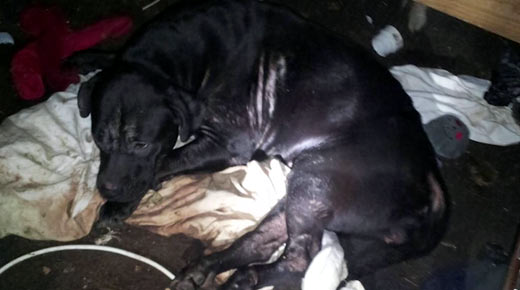 TEXAS -- The owner of a dead puppy found chained to a fence is now charged with animal cruelty after an investigation. 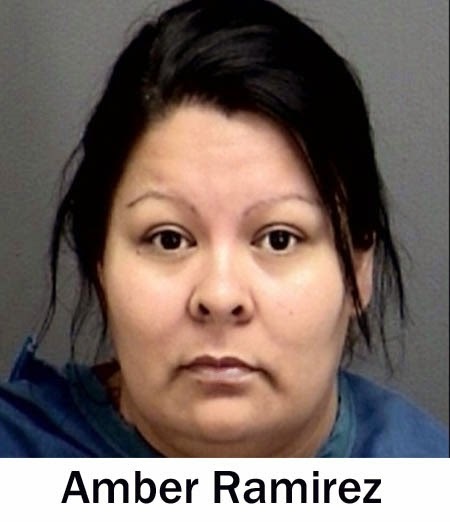 Amber Ramirez, 32, was arrested in the 1600 block of 22nd Street Monday night. Earlier this month officers say they went to her home to check reports of a deceased dog. When they arrived they found a dead three to four month old puppy chained to the fence. Officers say it appeared the dog had not been fed in some time. Ramirez told police that she owned the puppy and that she had tied it up outside because it was sick. Ramirez is charged with cruelty to non livestock animals. Her bond is set at $5,000. KANSAS -- A Wichita Falls woman was jailed after police found an emaciated dead dog in her yard. 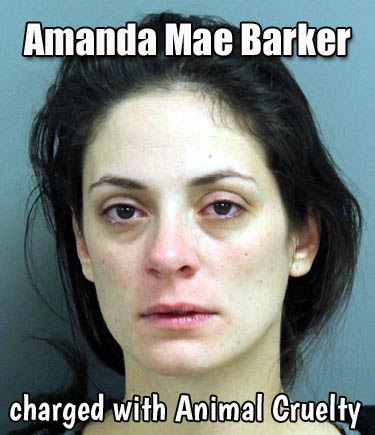 Amber Nicole Ramirez, 32, was booked early Tuesday on a charge of cruelty to non livestock animals. Police spokesperson Brandie Banda said police and animal control officers were called to a home in the 1600 block of 22nd Street Nov. 11 where they found a dead dog lying against a fence. The dog was emaciated had there was no sign of food, water or shelter. No one was at home at the time. Several days later, investigators made contact with Ramirez, who gave them differing stories on what happened to the animal, Banda said. 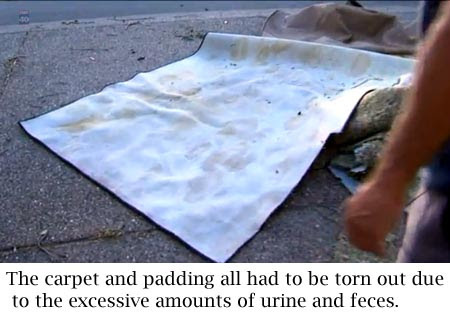 By that time, the dead dog had been placed in a trash bag, but was still in the property. Neighbors told the investigators the dog, a pit bull mix 3 to 4 months old, had laid in the yard Nov. 7-11 without food or water. Ramirez later admitted she had left the dog tied in the yard. 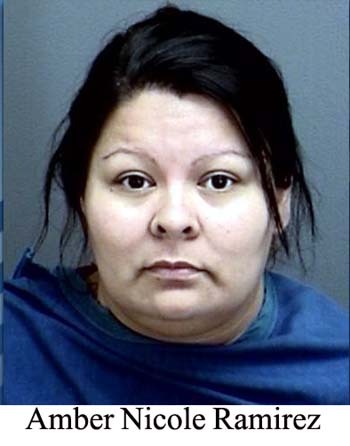 Ramirez’ bail was set at $5,000 and she was in the Wichita County Jail Tuesday. 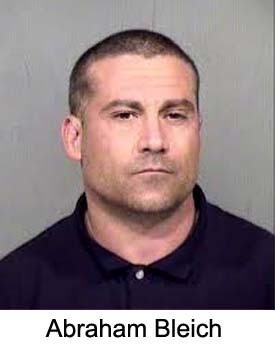 ARIZONA -- Abraham Bleich (aka Abe Bleich), 35, was arrested in Maricopa County on November 25, 2014. No other information about this case could be found. 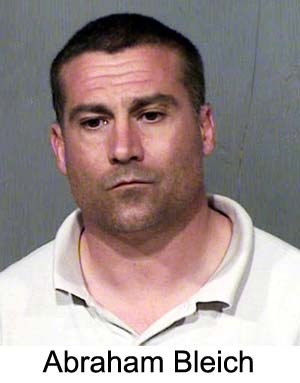 Bleich's troubles with the law continued after his animal cruelty charge. A community watch in north Phoenix has a single focus: one of the neighbors. 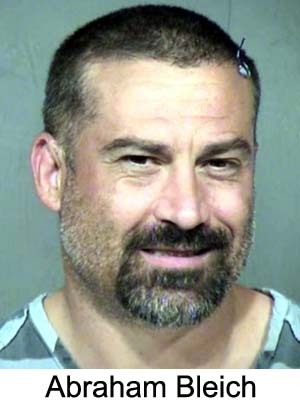 On a cul-de-sac street near Cactus and Cave Creek roads, six residents have restraining orders against neighbor Abraham Bleich. There are eleven houses on the street. “I don’t want to be afraid to live in my own home,” said Jennifer MacPherson, one of the residents who took out a restraining order. The restraining order Donnie Lantrip filed against Bleich on Friday bans Bleich from any contact, including flying drones and throwing rocks. The behavior got particularly bizarre at times, Lantrip said. "He climbed over this [concrete wall] naked one night, and just stared at us like a tiger,” Lantrip said. MacPherson said that Bleich’s drone crash landed in her backyard. She said he used it to spy on the community and posted videos of what he saw online. 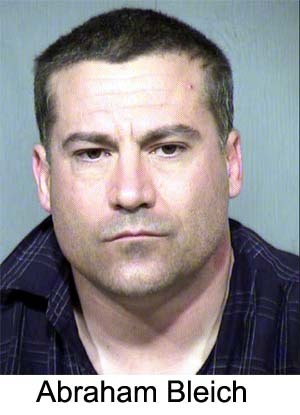 He approached MacPherson in her garage while she was unloading groceries and screamed at her, MacPherson said. 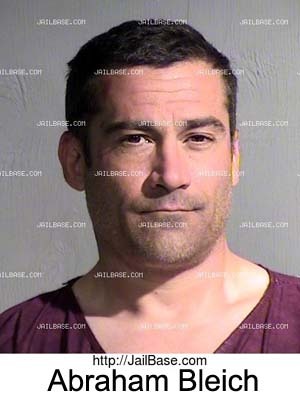 Bleich was in jail Tuesday night. Lantrip said Bleich punched him in the face while Lantrip was discussing the ongoing issues with another neighbor. No one answered the door at Bleich’s home. Lantrip said the issues have been ongoing for several years. 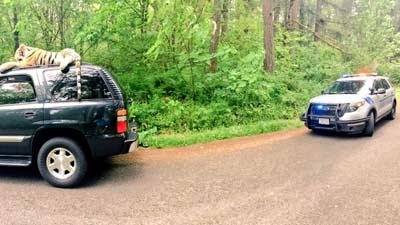 Man threatened dog, fatally shot self. No tears from me. FLORIDA -- Dennis Emery was no stranger to the law. He had run-ins with Pinellas Park police 34 times since 2012, and was arrested last month three times in less than a week. But Tuesday morning, police got their final call from his home. "He was involved in a domestic disturbance with his wife. During that disturbance he retrieves a firearm, he produces the firearm, and he threatens to shoot one of the family's animals," Pinellas Park police's Sgt. Adam Geissenberger said Tuesday. Police say he cocked the gun, lowered the hammer, and then for some reason turned the gun around toward his face right as it fired. Based on witness statements, investigators believe it was an accident. "It's a shame. It's a damn shame. 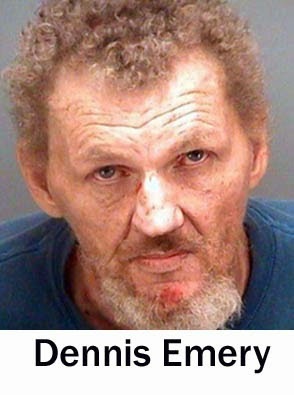 I never figured him to be irresponsible with a handgun," next door neighbor Dallas Collins said. Collins says Emery's wife owned 13 border collies. He says the dogs' barking was a constant problem between the couple. "Anytime, day or night, it doesn't matter," he said. The dogs made it out of the fight just fine. But Emery's family is now mourning the loss of their loved one. "We're very close the holiday. Loss of life, regardless of the situation, is very tragic and now this family has to deal with the loss of a loved one very close to the holidays," Geissenberger added. While police say the shooting appears to be accidental, they haven't ruled out suicide. 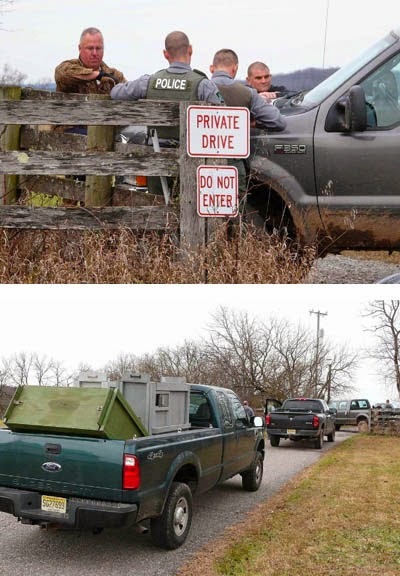 NEW JERSEY -- Standoff may be too strong a word, but for an hour an enormous gray pickup truck blocked access to Russ and Brenda Oakes' property, which until 12:30 p.m. today was home to Daisy, Dilly and Dandy, three illegal pet deer. In a letter to Gov. Chris Christie, Mr. Oakes explained, "My wife has been raising and releasing deer for the past 15 years. These fawns were brought to her by police officers, animal control officers and others... mostly all cases where the mothers were killed by cars and the babies were still by their sides." He wrote, "Brenda has a very big heart, too big at times." 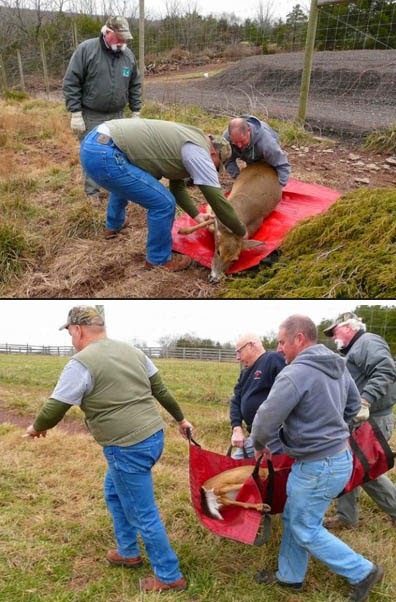 He asked that she be granted a wildlife rehab permit because of her extensive experience helping deer and her volunteer work with veterinarians. Their 7-acre home site, which is surrounded by the township's Horseshoe Bend Park, is home to horses, goats, parrots, cats, pot-bellied pigs and dogs, almost all of which, Mrs. Oakes says, were wished onto her by someone who couldn't or wouldn't take care of them. There is no law against adopting such a menagerie, but there is a law against adopting wild species. Of course there is a law against adopting wild species! You can pay the state wildlife officials a permit and kill the deer but god forbid you keep one as a pet. 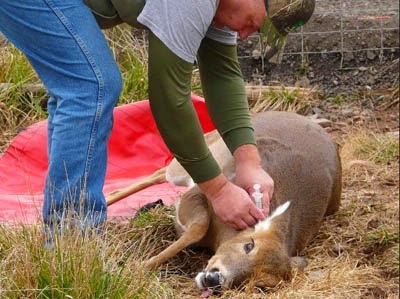 They say that the "kill rate" is only about 50% -- meaning, the other 50% escape only to die slowly of the non-lethal wounds inflicted on it by hunters. Starvation, dehydration, drowning in their own blood, open wounds get infected and poison their blood, they fall down from weakness and injuries and then are attacked by coyotes, wolves and or dogs. All of these things are legal b/c well hey you're the mighty hunter and you can't help that you couldn't find the poor animal you shot at.... but this woman is considered a criminal. 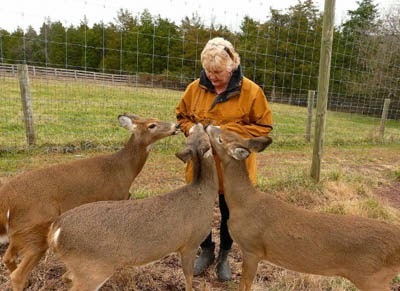 She had released previous deer she'd raised back into the wild, but when Horseshoe Bend Park was established and deer-hunting was allowed there, she couldn't bear to let her three most-recently raised deer become targets. They are now 3 and 4 years old and live in a fenced area in her yard, although they are sometimes allowed in the house. At 9:30 Monday, with the authorities due at 10 to take her three deer, Mrs. Oakes was in the deer yard petting them and feeding them grain. "I realize it's a law," she said, "but I think it's not black-and-white. This is in a gray area; there should be some way to get around it. It's not as though I'm keeping deer in the city, or the deer are not in excellent shape. They are well cared for, and they are only going to be taken to another fenced-in area. Why not leave them here?" 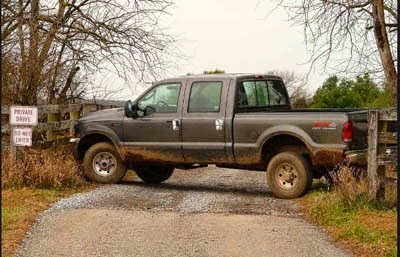 I was taking my dog to the dog park and drove too far, and when I tried to back out, my truck got stuck here. And it broke down. And I lost the key. My dog? It done runned off. I called Triple-A about the truck and they're trying to confirm that I'm a member. But meanwhile, Ross, here, has been real nice about having me stuck here. 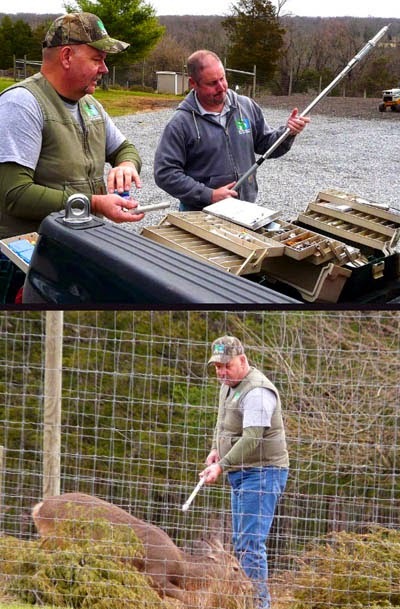 At about 10:20 the state Division of Fish & Wildlife people arrived in several vehicles, including a pickup truck carrying three wooden deer-transport boxes. Capt. Frank Panico with another armed conservation officer handled negotiations, first with Moscal and then with Mr. Oakes. Despite Moscal's civil disobedience, the officers smiled at his implausible playacting and didn't press the issue. Oakes said his wife needed more time to resign herself to the loss of her pets. While Larry Herrighty, assistant director of operations for Fish & Wildlife, and two wildlife experts stood by, the officers discussed the situation with Mr. Oakes, who offered his objections to the law that would deprive his wife of her beloved pets without improving the animals' living situation at all. Without arguing, Panico expressed the belief that rules are necessary to prevent chaos, and they should be followed. The officers' patience was rewarded after an hour when Mr. Oakes got his wife's unhappy consent to let the Fish & Wildlife people do their jobs. Moscal suddenly found his ignition key and removed his truck. When the Fish & Wildlife entourage arrived at the house, Mrs. Oakes left the premises. Syringes with sedatives were affixed to poles. "Start with Dandy," said Mr. Oakes, "she's protective of the other two." After a few minutes of pursuit mingled with coaxing, all three deer were jabbed. It was remarked that a tranquilizer gun could've been used, but the syringe doesn't damage muscles. 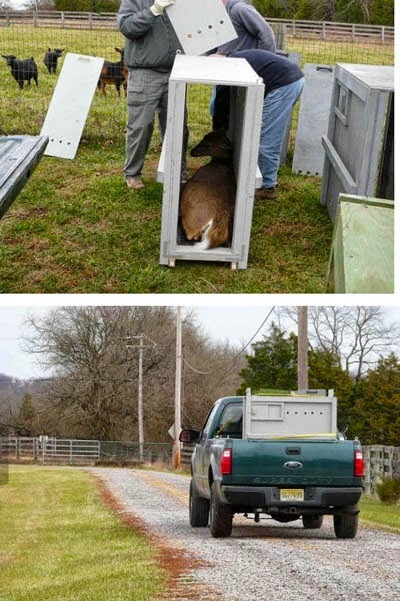 Unconscious, the deer were gently carried out of their pen on slings one by one, put into the wooden boxes, loaded onto the truck, and driven away. Mr. Oakes said that he wasn't told definitely where the deer will be taken, but that they will live in a fenced area in a New Jersey park. He also said that his wife had not been issued a summons for breaking the law. Mr. Oakes had sought relief from a variety of non-elected and elected officials, including the governor, but he doesn't think Christie ever saw his letter. Family friend Morgan Taylor wrote to Kingwood Township Mayor Phil Lubitz asking him to intercede on behalf of the Oakes family. In the letter, Taylor recalled that after Dandy's mother had been hit by a car, Mrs. Oakes had bottle-fed the fawn and stayed up at night holding her to keep her warm "even at times letting the deer into her own bed so she could get some sleep." 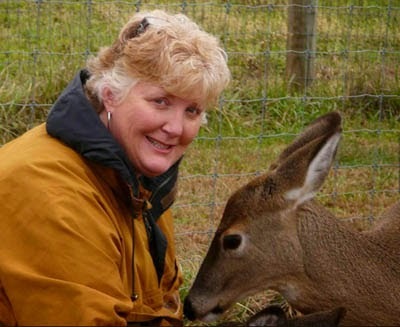 Tayor said, "The love she has for her animals is the same love that a mother has for her children, and that's how it's always been, especially with her deer." NEW YORK -- Seven dogs and three rabbits — many suffering from respiratory infections, emaciation, overgrown nails and severe matting — were removed this week from a home in Tilson, according to the Ulster County SPCA. At least one of the animals also had a broken limb, a press release from the agency stated. Laurie Hussey, 51, of Tillson, was charged Tuesday with 10 counts of animal abuse for failure to provide sustenance, all misdemeanors under the state Agriculture and Markets Law. Hussey faced similar charges in 2012 in Rennselear County following the removal of 26 small-breed dogs from her home there, the Ulster County SPCA said. Acting on a tip from the Rosendale police and believing Hussey was once again hoarding animals in a dangerous environment, SPCA Investigator Glenn Daniels obtained a search warrant for the residence. According to shelter medical staff, the symptoms exhibited by the animals are consistent with animals housed in a substandard environment. Hussey is to be arraigned Tuesday in Rosendale Town Court. OREGON -- Deschutes County sheriff’s deputies raided a property east of Bend Monday night and cited two women on animal neglect charges, seizing 30 dogs and five puppies they said were living in their own waste, some severely emaciated and many suffering from health problems. 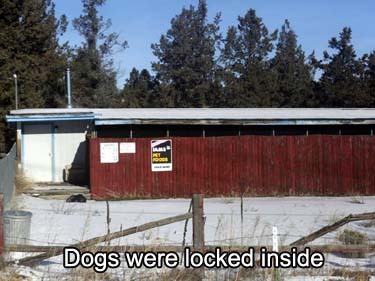 Earlier in the day, around 11:20 a.m. Monday, animal control technicians were dispatched to an address east of Bend on a report of at least two dozen dogs being kept in unsanitary conditions, said sheriff’s Lt. Deron McMaster. Investigating the complaint, McMaster said they found at least 30 dogs and five puppies being kept in kennels, cages and at least five in small pet carriers. A search warrant was prepared and executed around 8:30 p.m. by deputies and animal control techs, McMaster said. All of the dogs located on the premises were seized and placed into shelter. “Many of the dogs were suffering from a range of health problems, to include severe tooth decay, sores, mats, severely untrimmed toenails and severe emaciation,” McMaster wrote. 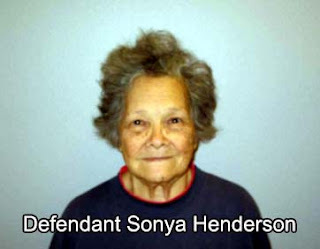 Goldie Coats, 55, and Sonya Henderson, 71, were cited on 35 counts of second-degree aggravated animal neglect and released. Coats also was charged with 33 counts of having no dog license, while Henderson was charged with two counts. McMaster said the investigation is continuing. The Humane Society of Central Oregon shelter received the dogs late Monday night in an operation that continued until early Tuesday morning, said Lynne Ouchida, community outreach coordinator. In a posting on its Facebook page, the HSCO said it will spend Tuesday processing and evaluating the dogs. "As we learn more about the case and the dogs, we will let you know how you can help," the organization said. "The dogs are part of a case and not available for adoption at this time." While McMaster did not list the address of the raid, a Web search under Coats’ name finds an undated Website with Coats listed as operator of Ranch Kennels on Nelson Road, with this motto at the top: "You Care and So Do We." "We keep the staff small to insure consistency of care and a familiarity with the pets," the kennel's Website says, adding that the facility is "on 14 acres just east of town with 46 indoor-outdoor runs, a play yard and a separate cattery with 11 runs." "We offer radiant floor heat and forced air heat in winter, and abundant fresh air, and always music on the radio," it goes on to say. "We specialize the care for each individual pet, and make adjustments as to feeding schedules, play activities and geriatric or special care as needed." It says Coats is a graduate of the Bel-Rea Institute of Animal Technology in Denver and "has been an active certified veterinary technician for over 15 years" before taking ownership of the kennels. It says she is a "serious hobby breeder and advocate" for the Brittany Spaniel, competing with them in hunt tests, field trials and confirmation shows, and "time permitting offers rescue services for Brittanys." A link on the Website to boarding information is broken, as is one to Coats’ Wyngold Brittanys breeding business, which a search finds also is still online. It says it was established in 1976 and displays an American Kennel Club “Breeder of Merit” award. Henderson is listed as a basset hounds judge on the AKC Website, approved in 2007.
nourishment to his dog that was found Oct. 8 running down North Main Street in Canandaigua. 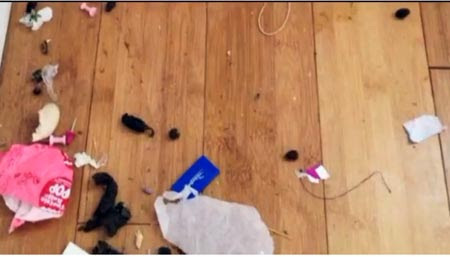 Deputies said the dog, a 6-year-old female, a Peekapoo, had a severe infection in her mouth that caused part of her jaw to deteriorate. Her fur was matted with feces, she had fleas, parasites and a skin infection, deputies said an examination showed. The dog was treated by several veterinary clinics and is now in foster care, deputies said. Johnson was given an appearance ticket to appear in City of Canandaigua Court and released. 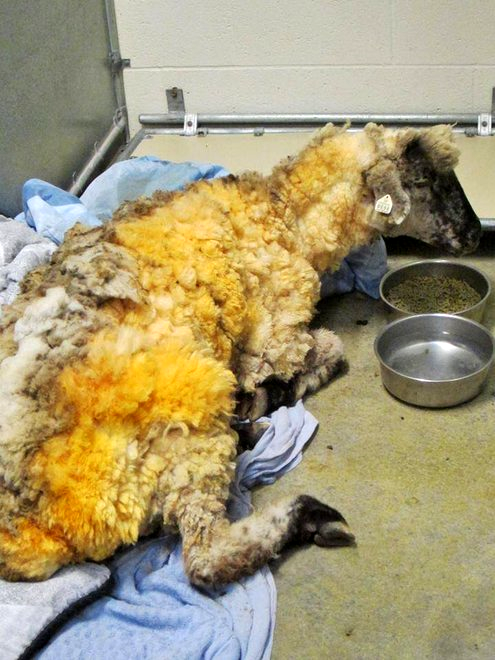 IDAHO -- Earlier this month, a sheep was taken into the Canyon County Animal shelter after it was found down in a field for more than five days without food or water. Despite the hunger and the dehydration, it was her fur coat that surprised workers. 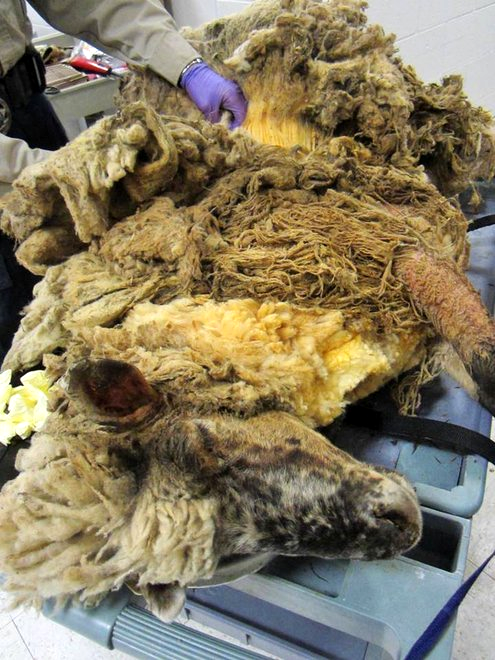 The sheep, nicknamed Dolly by staffers, had almost 50 pounds of urine soaked wool from her body. 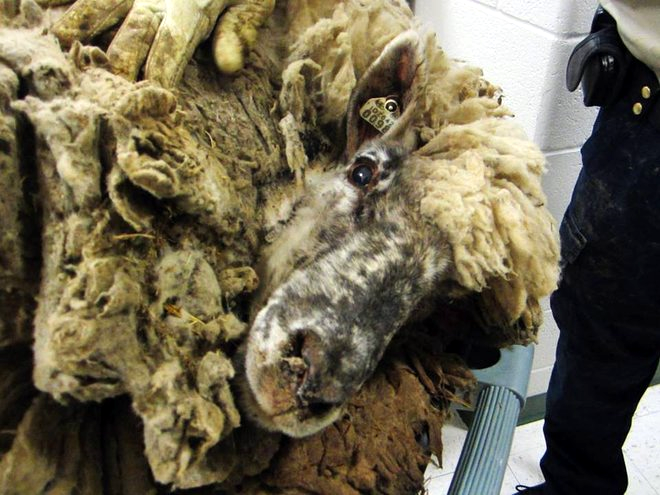 "It took three people nearly an hour to cut her free from her wool shackles," the animal shelter said. It's unclear just how long it's been since Dolly had been sheared. "Day by day this girl gets better and better," the shelter said. Dolly is being held in a dog run and will be looking for a new home when she is cleared medically. It's unclear who owned the sheep. Canyon County officials told KBOI 2News that the sheep was found off Highway 19 in Greenleaf. 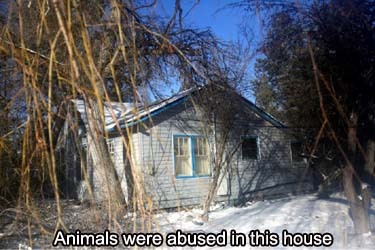 The owner, who has not been identified, will likely be charged with animal neglect. The sheep's wool was so matted in urine it could not move and most likely would have died in the cold. 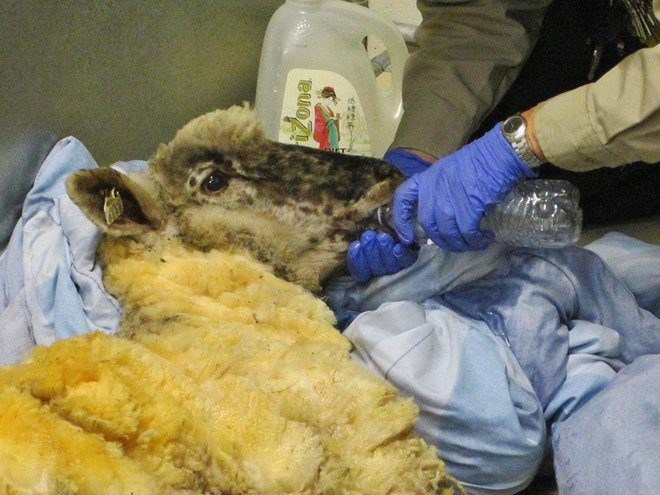 "It was obvious that the sheep was really matted and that it hadn't been properly cared for," said Lt. William Adams with the Canyon County sheriff's office. "Being a domestic sheep like that it needs to be regularly sheered so it can get the extra weight off it so it can move freely. In this instance the sheep was not cared for and caused it to lose mobility." BERMUDA -- A woman has spoken of her devastation after one of her dogs was mauled to death in an attack by a neighbor’s boxer. 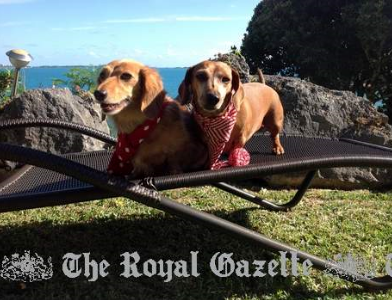 Amy Ponnampalam’s dachshund Annie was killed and her other dachshund Briea was critically injured as a result of the attack last Wednesday. The male boxer has been seized by the authorities and its owners, John and Sarah Tomlinson, are under investigation by the government’s animal warden. The fencing on their property was not functioning, which enabled their three boxers to trespass on to Ms Ponnampalam’s Smith’s property. One of the two male boxers is believed to have carried out the attack. 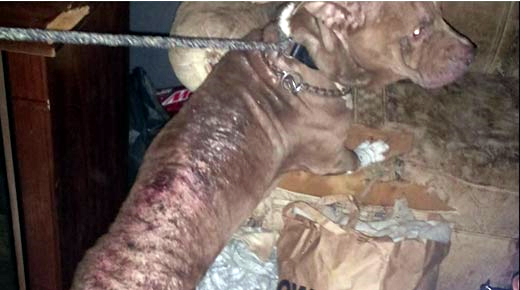 The other two boxers have been given an absolute discharge while the male boxer in question continues to be held pending the construction of an enclosure around the owners’ Smith’s property as recommended by the Department of Environmental Protection. It is unclear whether the animal could be euthanized as a result of the attack. Ms Ponnampalam was at work last Wednesday when she received a call from Endsmeet Animal Hospital informing her of the attack. A neighbour saw the boxer mauling the second dog and shooed it away but arrived too late on the scene to save Annie. Endsmeet arrived to give medical attention to the surviving dachshund, Briea. As a result of the attack, Briea sustained a deep bite wound to her groin which has caused bleeding from her arteries and she has trauma and bruising to her rib cage. She also injured a tooth but is too weak to undergo surgery to repair it at present. Ms Ponnampalam was advised by Endsmeet staff not to view the body of Annie. According to the Dogs Act 2008, a person who keeps a dog commits an offence if the dog causes death or injury to a person, or the animal strays off the property of the keeper. Ms Ponnampalam has sent a statement to the animal warden and is working on a legal case against the boxers’ owners. Ms Ponnampalam said her dog Briea is back home and has started to venture back out into the garden. “She is healing but subdued and clearly puzzled as to where her companion is,” she said. Ms Ponnampalam described Annie as, “sweet-natured and loving”. “She was the sweetest dog. She was a beautiful animal both outwardly and inwardly. Outwardly, she had lovely long hair and was very pretty and inwardly she was just so sweet. She was very soppy and very protective of us — Annie was always our protector even though she was so little she would always protect the house. I think that is maybe what happened — she took the brunt of the attack because she always stood up for Briea. 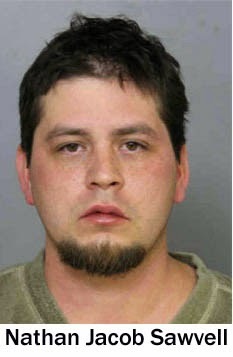 IOWA -- A Waterloo man was arrested for allegedly beating an acquaintance’s dog. Officers investigating the case found blood spattered on the floors and walls of the basement of the Cutler Street home where the attack took place, according to court records. They also discovered a pipe wrench matted with blood and fur. The dog, a 6-month-old terrier mix named Zeke, had broken teeth, an eye injury, a contusion on his face and a bloody nose, records state. Witnesses told police they heard the assault, and the suspect was the only person in the basement at the time, record state. 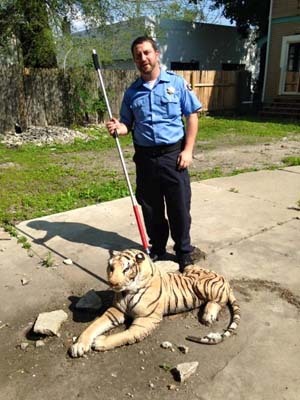 Nathan Jacob Sawvell, 32, was arrested Saturday on a complaint of animal abuse. The charge is an aggravated misdemeanor punishable by up to 2 years in jail. Bond was set at $2,000. CALIFORNIA -- After several situations involving potentially dangerous or vicious dogs, Rialto officials voted Tuesday to give police more authority on first-time incidents. VIRGINIA -- An Albemarle County man is facing three animal cruelty charges after police say they discovered three dogs living in deplorable conditions on his property. 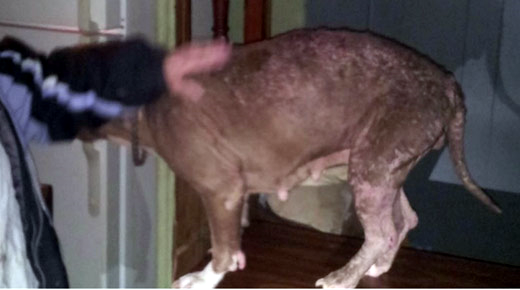 Police seized the pitbull mixes from 48-year-old Richard Jones at the home he rented on Rockfish Gap Turnpike in Afton. Police say the dogs - Kara, Rooney, and Kira - were living in their own feces, infested with fleas, and had skin conditions with open sores. An animal control officer took the dogs to the Charlottesville-Albemarle SPCA for treatment. “This is something that's taken serious and the animal control officers respond and see dogs in a condition like that and they do feel it's appropriate to seize them immediately and make sure they receive treatment and the care they need,” said Cater Johnson, Albemarle County Police Department spokeswoman. A judge ordered the animals be held until Jones goes to trial on the misdemeanor cruelty charges on December 17. Police say the dogs are improving. UNITED KINGDOM -- A mother called in animal experts fearing an escaped crocodile was on the loose in her garden - before being told it was in fact an inflatable toy. The woman, Plymouth, asked neighbours for assistance but called police after they agreed it was too dangerous to approach the creature without protection. Officers from Devon and Cornwall Police attended and called a team of wildlife experts from Dartmoor Zoo, who set off with snare poles, nets and riot shields. The officers threw water over the crocodile from a safe distance and gingerly approached when it did not move. It was then that they realised it was an inflatable toy. It was removed from the garden and placed in police custody, while the Dartmoor Zoo team were stood down. "I was making my lunch in the kitchen and looked out into the back garden," the home owner, who did not wish to be named, said. 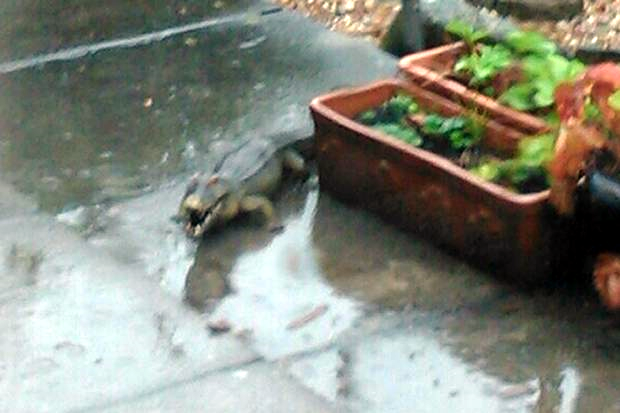 "It was pouring with rain and I saw what I thought was a crocodile in the garden. I went to my neighbour's house to ask if they would come and have a look at it. "They did think it was a baby crocodile and suggested calling the RSPCA or the police but we decided to call the police as I have a three-year-old and was worried. "A policeman and a policewoman arrived and at that point we were all a bit suspicious because it hadn't moved. One of the police officers bravely went out to have a look. They threw water on it and it didn't move. I'm absolutely mortified." A spokesman for Devon and Cornwall Police confirmed that officers attended the incident following the woman's call at 12.20pm. "We received a call from a concerned member of the public reporting that an escaped crocodile was in their garden, approximately 3ft in length," the force spokesman said. "The caller was concerned for her child and the RSPCA and Dartmoor Zoo were informed and on their way to the zoo. Police officers attended and bravely investigated. The beast turned out to be an inflatable toy crocodile. Police have apprehended the crocodile." A spokesman for Dartmoor Zoo said experts were regularly called out to deal with escaped pets including lizards and snakes. He said the zoo received a call from police at around 12.30pm and assembled a team to attend the garden within 15 minutes. 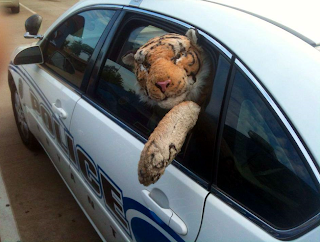 "The team were on the road with all the equipment needed," the zoo spokesman said. "They were halfway there when we received a call from the police to say it was a toy. "Our team have a variety of equipment to deal with such situations, including snare poles, nets on poles and riot shields. "We also have dart guns but did not bring them on this occasion."